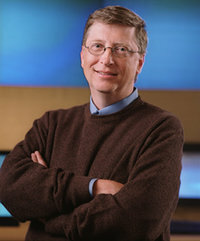 William Henry Gates III, KBE (born October 28, 1955), commonly known as Bill Gates, is an American businessman and a microcomputer pioneer. Along with others, he wrote the original Altair BASIC interpreter for the Altair 8800 (an early microcomputer). With Paul Allen, he co-founded Microsoft Corporation, and is now its chairman and "Chief Software Architect". On March 2, 2005, the Foreign Office of the United Kingdom announced that Gates would receive the title of Knight of the British Empire for his contribution to enterprise in the United Kingdom and his efforts in poverty reduction around the world. Because he is not a Commonwealth citizen, he cannot use the title of "Sir" but he may put the letters "KBE" after his name.